Every single pasuk except 8 in megillat Ruth starts with the letter vav. Is there any reason for this or is it just a quirk of how it was written? If there is a reason, what about the 8 pesukim which do not start with a vav? Rabbi Chiyya says "All the starts of verses in Ruth have "Vav"s except for 8, since she cleaved to the Covenant that was given on the eighth day (circumcision). The justifcation for the "vav"s is : Woe ("Vai") to the generation that judges their judges. Woe to the generation whose strong ones are low. See also Tosfos Hashalem (4:24 note 4) and Chida in Simchas Haregel (beginning note 7) who discuss this and some midrashic / mystical interpretations. Chida: every single Passuk begins with a vov aside for 8 pesukim, the eight verses begin with 8 letters YUD SHIN AYIN YUD BEIS ALEPH HEH LAMED. His students explained that the letters can be read as YISH’I B’OHEL. All the pesukim begin with a vov, a link, but my salvation comes from the ohel (tent), that Moavite males were responsible and not the females comes from (in one answer of the gemara) the fact that Sarah was B’OHEL. 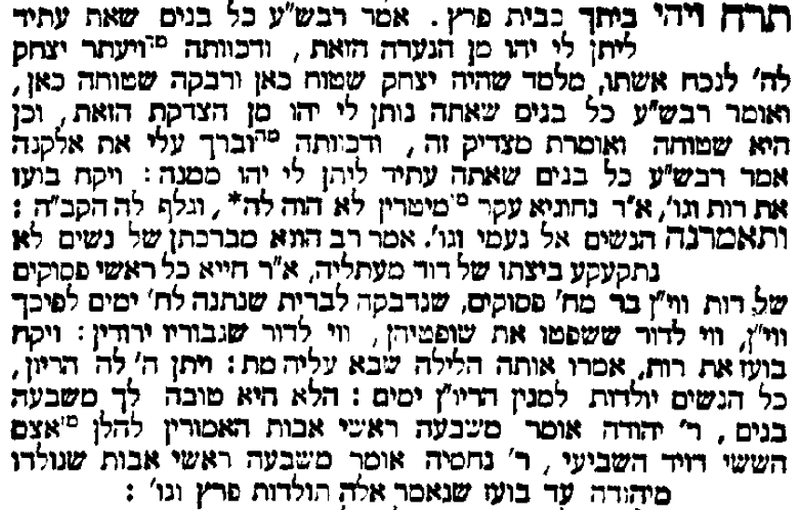 As the story of Rus is the story of Dovid's lineage and as many meforshim point out that the backdrop to the story is whether a Moavite can become Jewish, and as we know Moavi v'lo Moavis (male converts from Moav cannot marry into the Jewish congregation, but females can) the reason being, as the Gemara says (Kedushin I think) that the women were not blamed for not going out to help the Yidden because Kol Kevuda Bas Melech Penima, that women are meant to be modest and not mingle with people outside the community. This is what is alluded to by Yishi BeOhel that Sarah did not come outside and mingle with the guests rather she stayed inside the tent. Not the answer you're looking for? Browse other questions tagged aleph-bet-letters book-of-ruth .